Before the end of my 7 th grade year I never really knew what THON was. I saw the Penn State students in the streets with their cans and would occasionally convince my mom to let me hang out of the car window and give them a few dollars. I once asked my mom why they were standing outside and she told me that they were fundraising for a 46-hour dance marathon. Being unaware of what this actually meant, I always just pictured some kids dancing on a stage for 46 hours and couldn’t comprehend why anyone would ever do that. I also knew it was for childhood cancer, but I never heard of Four Diamonds until it helped save my brother’s life. So, let me tell you about my family’s journey. It all started in August 2010. Colin, my older brother (15 at the time), was complaining about pain he was having in the left rib area. He and my parents did not think much of it because he was always a very athletic child. Colin participated in football, basketball and baseball throughout his childhood (baseball being his favorite). After the pain continued for some time, my parents took him to his family doctor, and after examination, he was told to rest- no sports, weight lifting- more than likely this was a pulled muscle. In December of 2010, the pain seemed to worsen. Again, after another examination, Colin was sent to physical therapy. After two months of therapy, he was feeling better and went on to have an outstanding baseball season. It was the second week of May that same year, the last week of regular season, when Colin noticed a lump on his rib. I distinctly remember sitting in our living room jokingly saying “watch it be cancer or something,” not knowing what news we were about to face. My parents took Colin in for an x-ray, then a CT scan, and then received a call from the doctor to go to Hershey that same day. I was in school at the time this was all happening and had no idea what I was about to come home to. My mom called me right as school was ending and told me to come home right away. I could tell in the tone of her voice that something wasn’t right. It was Friday, May 13, 2011. Yes, Friday the 13th. I was walking up my driveway when my dad and sister came running outside and told me that Colin had bone cancer. My 15-year-old brother had cancer. I was speechless. Colin’s next step was to complete a series of biopsies and tests to determine the type of bone cancer and if it had spread to other parts of his body. It was confirmed that Colin had Ewing’s sarcoma in his ribs and, luckily, did not metastasize. This increased his chance of survival significantly. These two weeks were a blur for me. Shortly after his diagnosis, I remember sitting in my car asking my mom a series of questions. Prior to my brother, I never dealt with a cancer diagnosis --especially one in my immediate family. One of my most troubled thoughts was how my family was going to afford Colin’s treatments. It was during one of the visits for a biopsy that my parents learned more about Four Diamonds. Greg, the social worker, approached them while sitting in a waiting room. It was in that waiting room that he informed my parents that they did not need to worry about any of the medical expenses- they would be covered by Four Diamonds. It is through our efforts that families like mine weren’t burdened with large medical expenses. Not only did we NEVER see a medical bill, all supplemental medications were covered (Colin would receive over 100 injections in addition to his chemo regimen, costing ), gas cards and meal vouchers were provided for hospital stays, we were provided with superior caregivers and other staff and we were able to join this huge, loving family that we call THON. His treatment included chemotherapy and surgery. He started the chemotherapy treatments that June. He had a grueling 8-hour surgery that August to remove the tumor and the ribs above and below the tumor (he now has what he calls a numb “hole” on his side). In total, he underwent 17 rounds of chemotherapy. Nine of the rounds were done in clinic, lasting about six hours; the other 8 rounds required him to stay in the hospital for five days, receiving a treatment each day and hooked up on an IV the entire time. While what Colin went through was devastating, what many people don’t realize is the impact that a cancer diagnosis has on an entire family. My sister and I spent our first days of summer vacation in the hospital as we watched our brother undergo his first rounds of chemo in the clinic. During the entire next school year, we were rarely ever together as an entire family. During Colin’s 5-day hospital stays, one parent was always in the hospital and the other at home with my younger sister and me. When my brother was home, he was recovering. I couldn’t have friends over and even with the slightest hint of sickness, medical masks were necessary, as even a common cold could cause severe complications for my ill brother. 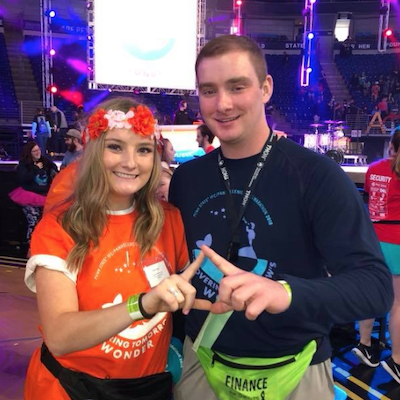 It was Four Diamonds and THON that got my family through these challenging times. The December after he was diagnosed, Colin had a CT scan which showed he was cancer free. That March he completed his chemotherapy treatments.